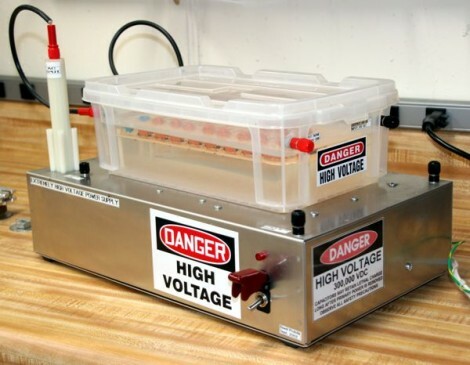 If you’ve already dipped your toes into high-voltage power supply pool you may be thirsty for a bit more knowledge. Here’s a neat illustration of how to build a voltage multiplier that can output a positive or negative supply. It is based on a design known as the Cockroft-Walton Multiplier. It’s the add-on housed in the plastic box seen in the image above. It uses diodes and capacitors in an orientation very common for generating high voltages. In fact, the same thing can be found in that high-voltage bulletin board. The place this differs is when it comes to connecting the multiplier to the PSU. If you look closely you can see one red and one black banana plug jack poking out the end of the plastic container. There is also a pair of these on the other end. The multiplier has been designed so that reconfiguring the inputs and outputs changes how it works. Each jack has been labeled with one possible input and one output. Choose the desired output (DC+ or DC-) and then follow the labels for the rest of the connections. What can you do with this setup? Check out the clip after the break that shows it powering a lifter. Like to see a photo of it in the dark to see how well the design suppresses corona at the connectors. Correction, if you’ve already dipped your toes into high-voltage power supply pool you may be paralyzed from the neck down. How is this ever supposed to reach 250 kV? Those cables and plugs certainly don’t seem up to the task and the air gap is far too small, with some safety margin you need around a meter. You can have 1MV on a #28 piece of wire if you wanted. The question is how much current is flowing at those voltages. If the current is low enough (which implies you’ve taken precautions against arcing), you can use a hair-sized piece of wire to convey whatever voltage you want. When I talk about the plugs and wire I mean their insulation is pretty much irrelevant to arcing at 250 kV (it could go straight through the insulation if need be, although it will just escape via the plugs). So it all comes down to distance, the usual precaution against arcing for 250 kV in air is a gap of >50 cm … this box doesn’t look large enough to hold off 250 kV from one side to the other. A child, bare feet, and high voltage. What could possibly go wrong? Can I use a variac transformer which can output 0~260VAC(5A) and then connect a Cockroft Walton Voltage Multipliers which use camera capacitor 104/1KV and 1N4007 as diode. Is there anything wrong?Why can’t i get that 10 times voltage? Did you ever find the answer to your problem? 1) the rectifier has a voltage drop of 1.1V which adds up over 10 stages. 2) The theoretical voltage is with no load; if there is any load on the circuit, it will drop the voltage. 3) Maybe there is some arcing across the components? At those voltages there’s shouldn’t be, but just a thought. I would love some guidance with the following parameters providing you have the time, thank you very much in advance. 1. For HV spark discharges such as would be used for brief demonstrative purposes, should a current limiting resistor somewhere in the range of 20k be placed in series with the output so as to better protect the caps/diodes? 2. The output voltage is regulated using a variac. By slowly regulating the variac, can a full range of output voltage from the multiplier be covered from 0 to around 250kV, or is there a starting bottleneck when dealing with the Flyback? Sorry, I know this is a very simplistic conceptual question. Again, the clarity is much appreciated. 3. The ambiguity of the instructions located on the blog site is making deciphering the physical layout of the circuit a little difficult. Please, if you could, correct me if I am wrong about the basic topography? An unregulated, low voltage DC power supply (4-12V) feeds the depicted flyback driver circuit connected directly to said flyback, who’s output feeds directly into the 5 stage cockroft-walton multiplier. So, where does the variac fit into this layout as its purpose is to regulate the overall output voltage? My guess would be, since it’s essentially a variable autotransformer, it’s tied in before the input to the flyback somewhere in the oscillator, not shown in the provided schematic. 4. For the purpose of using as little current as possible (in the range of uA) while still maintaining the high voltage output from the CW multiplier, should ohm’s law suffice to calculate the value of the required resistance to apply to the output of the multiplier, providing that no additional load is connected in either series or parallel with the resistance? Thank you very much for your time, and please answer at your leisure. So if this is the case, then the flyback should only be outputting about 13kV into the multiplier given that 8 stages are used to reach 250kV? Thanks again to all. Just trying to gain clarity. Have a great day.